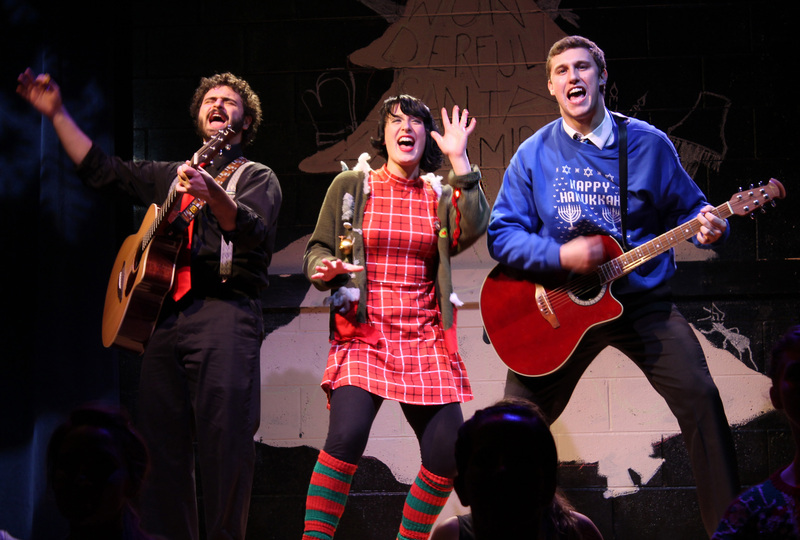 “It’s A Wonderful Santaland Miracle Nut-Cracking Christmas Story… Jews Welcome” is a Christmas cabaret from Stage 773 artistic director Brian Posen that seeks to hearken back to the wholesome Christmas specials of the 1950s. These were shows that came pre-packaged with a lot of jokes, a lot of song and dance, and heaping helpings of heart. Unfortunately, “It’s A Wonderful Santaland Miracle Nut-Cracking Christmas Story… Jews Welcome” also hearkens back to the staid hackiness of those fifties specials and even the unfortunate racial tone-deafness. This is a show with an all-white cast that features not one, but two rap numbers, a Martin Luther King puppet and an astoundingly uncomfortable joke about Kwanzaa—the joke is that two white people are telling you about it because no black people auditioned. With its big-band-era influences and lighthearted joie de vivre, the show actually reminded me of everything that is charming about “Family Guy” creator Seth MacFarlane’s throwback Brat Pack style. It also reminded me why I hate Seth MacFarlane. Now, if the show was funnier, I might have been too busy laughing to notice the more problematic parts. However, the comedy is, for the most part, uninspired. I didn’t mind that it’s a family show, so we weren’t going to get, say, an X-rated update of “I Saw Mommy Kissing Santa Claus,” but a deliberate lack of edginess does not excuse conceptual laziness. Most of the sketches are satisfied with simply referencing a famous Christmas character or trope, and then continuing to reference it until the sketch ends. Once you get the reference, that’s it. The comedy lacks that second or third gear that would take the bits beyond simple referential parody and into sublime silliness. And yet, the sketch that worked the best was actually the simplest: a kazoo-ified rendition of “O Holy Night.” It is simultaneously the show’s simplest conceit and its least lazy. It’s not the cast’s fault. They are essentially dance contestants doing their best to impress the judges despite being irreparably handicapped by the fact that their dance partner has shown up dead. No matter how hard they work—and they do work very hard—the material simply fails them at nearly every turn. One sketch, a holiday update of “Who’s On First,” is so creakingly written that I found it tough to watch as the actors paused for laughter and were met with silence. Imagine my relief when the following sketch made clear that it was meant to be unfunny. Now imagine that relief draining away as this follow-up sketch—which consisted entirely of a repeated poop joke acronym—was also painfully unfunny. Even as my eyes were cast toward the ground, my heart went out to this cast. Normally, a less-than-stellar show doesn’t bother me. It’s a professional hazard, seeing subpar theater, and one that I encounter with enough frequency as to be well prepared. And yet this show got under my skin. It rankled me. Why was that? I think it is because the laziness of the humor—which extends to the show’s many updated lyrics to old Christmas classics, often stretching the original meter well beyond its breaking point—belied a cynicism regarding the whole endeavor. Christmas shows are very popular after all. People who wouldn’t be caught dead seeing the RSC perform “Hamlet” will gladly take in a Christmastime spectacle. These are the kinds of shows that can make money hand over fist, regardless of quality. And that is ultimately what this show felt like to me: a cynical cash grab. So whenever the show was aiming for genuine pathos—stuff like the importance of family and the true spirit of Christmas—it made me even angrier. You can ask me to sit here and listen to your terrible jokes but don’t ask me to believe that it all means something. Please. Stage 773, 1225 West Belmont, (773)327-5252, stage773.com, $25. Through December 28.